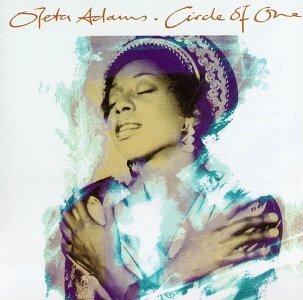 The year was 1990 when singer/composer/musician Oleta Adams warmed our hearts like a roaring fire on a cold winter’s night with her debut release, Circle of One. There was a new voice bringing forth a new song in a time when everything seemed so synthesized. Her resonance grabs you with its clarity. You hear her every note and word without studio enhancements. She tells wonderful stories in her music of love, hope, faith, family, and life. Her musicianship is superb as she mesmerizes you on piano, keyboards, or organ. “Get Here“, written by Brenda Russell, became the unofficial anthem of Desert Storm. The soulful tracks “Circle of One” and “Rhythm of Life” were also popular. Her ballads “I’ve Got to Sing My Song” is a personal testimony and “You’ve Got to Give Me Room” tells poignantly of a love that can no longer grow. Her reading of “Everything Must Change” comes from a heart filled with emotion and the bonus track “Don’t Look Too Closely” invites us to come look deep inside her soul. Oleta’s roots are in gospel which is evident in her soulfulness, brilliance, and control of a note. She also received classical training. She got her big break when the members of the band Tears For Fears saw her performing in Kansas City. She went on tour with them and recorded the songs “Woman in Chains” and “Badman’s Song” on their Seeds of Love album (“Woman in Chains” can also be found on The Very Best of Oleta Adams.) This pairing lead to a record deal and the recording of her solo album, Circle of One, which Roland Orzabal of TFF produced. Her husband, drummer John Cushon, played on her first album and has been with her ever since. I got to see her at an outdoor festival earlier this summer and I must say, she gives her all on record and in her live performances. A hush fell over the crowd as she sang “My Heart Won’t Lie“, “Get Here“, and “I Just Had to Hear Your Voice” and we got up and danced on her mid and uptempo songs. She performed for over an hour and a half and she was magnificent. Her star definitely shines bright in my heart and I really hope that we can look forward to some new music from this amazing woman. Enjoy your music. LaNita brought to my attention that Oleta sang “Love Never Forgets” in the movie How Stella Got Her Groove Back but it was not included on the movie soundtrack or on any of her albums. I ran out and got a copy of the movie to hear the song again and we will check to see if the song is currently available or will be available in the future. Stay tuned!! Update: j-notes.com correspondent LaNita has learned that the song was an only an interlude for the funeral scene and not an entire song. This is why it was not included on the original movie soundtrack. Oleta sang “Many Rivers to Cross” on the Jason’s Lyric movie soundtrack and it also on The Very Best of Oleta Adams. She also teamed with Brenda Russell on the gospel flavored “We Will Find A Way” from the Corrina, Corrina movie soundtrack which also features Dinah Washington, Sarah Vaughan, Louis Armstrong, Oscar Peterson, and Billie Holiday. Amazing how one question can lead you down so many different roads. This entry was posted on Friday, August 22nd, 2003 at 6:38 am. It is filed under Flashback Friday and tagged with Circle of One, Flashback Friday, Oleta Adams. You can follow any responses to this entry through the RSS 2.0 feed. i am all over this one. i remember when she appeared on oprah for the first time. the show was about pure vocal talent. it also featured the budding group en vogue. oprah made such a stink about “Get Here”. i love me some oleta! LUV HER! Have you been listening in to my recent bedtime music? I’ve been playing this the past few nights. I love all her music… saw her Valentine’s weekend this year at a concert in Brooklyn (she opened for Freddie Jackson)…. “You Need To Be Loved” from Movin’ On is my standout track… I can listen to her for hours… matter of fact, I will….. I love Oleta…reminds me a lot of Anita Baker’s music. There is one song by her that I cannot get my hands on anywhere. It’s from the “How Stella Got Her Groove Back” movie. Oleta sang it during the funeral for Whoopi’s character. It’s not on the soundtrack:( If anyone knows where to find it, please clue me in on it, too. Does anyone know how I can get a copy of the original score of “how stella got her groove back”? I am also interested in getting a copy of the interlude of “love never forgets” by Oleta Adams. I am also interested in finding out where I can locate the song “love never forgets” by oleta adams that was played during the funeral scene of whoopi goldberg on “how stella got her groove back”. i’ve been searching for a few years for this now….help!! I too am desparately searching for “Love Never Forgets” from How Stella Got Her Groove Back. As soon as some finds out how to get it, can you let me know as well? It is almost as if the song never really existed. I can’t even find a vinyl pressing on GEMM or Musicstack. This is out of control! Please, please, please let me know if you find something. I sure wish she would continue to put out more albums. My favorite is “Beams of Heaven”. Though I am not a big gospel listener, this one really gets to me.